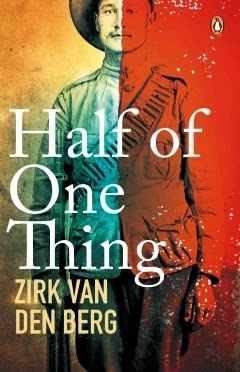 Zirk Van Den Berg has produced a terrific read with his latest book Half Of One Thing. It is a historical war adventure, a love story and a spy thriller all intriguingly interwoven against the backdrop of the 2nd Anglo Boer War. Gideon Lancaster is a New Zealand soldier fighting for the British forces during the Boer War. His mother was born in Holland and, as a consequence, he is fluent in Dutch. Using this skill, he is able to infiltrate a Boer Commando as a spy for the British. As he gets to know - goes into battle with and learns to admire - the men in the commando, he finds himself conflicted as a far as loyalties are concerned. This problem is further complicated when he falls in love with a spirited Boer woman, Esther Calitz. She is a no-nonsense character who demands loyalty above all else. His rival for the love of Esther is the inflexible and cruel Commandant of the commando, Jacob Eksteen. This is the man whose confidence he has to win if he is to stand a chance at succeeding with his mission. Lancaster finds himself torn by powerful and conflicting demands of loyalty, fidelity and love. In a desperate effort to find a solution, he plays both ends against the middle with surprising results. Zirk Van Den Berg is a Namibian born South African who now resides in New Zealand. He has written several books, both in English and Afrikaans which in itself is quite an achievement. However, his soul must remain South African as his marvelous descriptions of the stark beauty of the African veldt and starlight African skies could only have been be written by a son of this land. He develops characters that are multi-dimensional and interesting - and his South African background is again revealed by his deep understanding of the tough God-fearing “boere volk”. At only a little over 200 pages, Half of One Thing is not a very long book. It is, however, a big story which raises many issues about the consequences of war, loyalty and allegiance. An enjoyable book which also gives one food for thought.